I love the Confetti Bold Print background stamp by Hero Arts. Stamped black on white, it reminds me of dalmatians (I used to collect dalmatian stuff). Paired it with a pink balloon image from Balloon Animal Birthday. This would be cute for a little girl. MOOD WHEN DONE = Today is the 1st anniversary of the day I retired. Let's party!!! 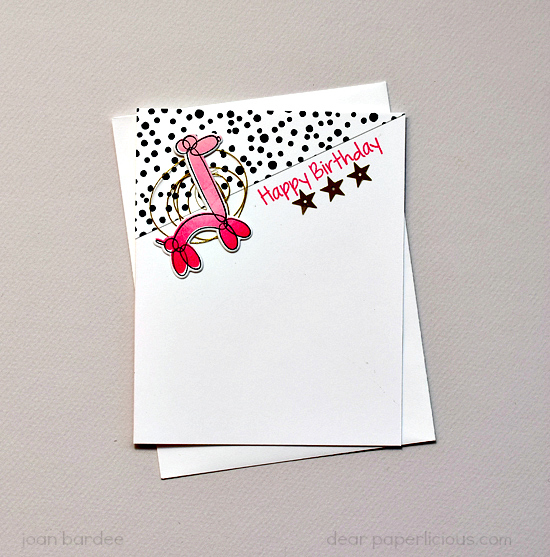 Super fun and playful design and card, Joan! Oh, my gosh, that's so cute and fun and done in your always amazing CAS style. How you make each CAS card look so different is beyond me. Really love the balloon animal stamp! Darling card - I would like it and I'm an "old" girl! Adorable!!!! Love the spots paired with pink, and the layout is fabulous.